Somehow, when you talk about Indian art, you think of exquisite bronze sculpture or fine wood carving or Mughal miniatures...and you forget the everyday beauty that Indian women create in their homes, all across the land. I am stunned by the variety and richness of Indian folk art whenever I encounter it. How can one contiguous land mass spawn so many diverse styles, so many forms of aesthetic expression? 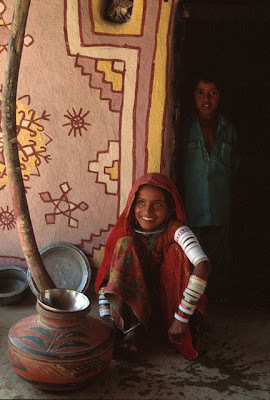 The point came home to me yet again when I saw a collection of photos of everyday life in Indian villages. The photographer is Dr. Stephen Huyler, an American who has spent 30 years in India, and published several books. 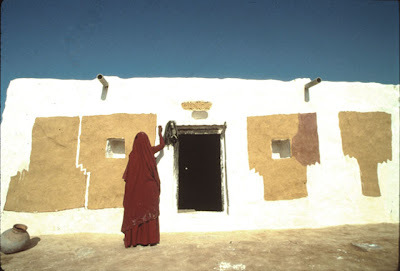 The photo above is of a small hut in Kutch, Gujarat. It is from his book, Painted Prayers. Here are some more photos from his collection: this one below is from Jaisalmer in Rajasthan. I was struck by the sophistication of the lady's sense of aesthetic - her eye for form and shape and contrast is undeniable. The way she is making her home rise from its desert surroundings is just stunning. And here is another photo from Sawai Madhopur, on the outskirts of Ranthambore Tiger Sanctuary. 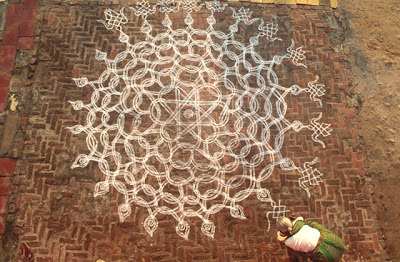 Walls and floors in this part of India are often decorated with elaborate drawings. I've seen life in that area of Rajasthan - the land is arid, life is hard I'm sure. And in the middle of it all is someone creating beauty and serenity. And this, the last one below, from Tamil Nadu - what went through her mind, as she drew this? Did she feel the beauty? I have drawn smaller versions of these myself, with rice powder and rice paste, and I know how engrossing the activity is, and how much you can lose yourself in it. These are just a small sample from Dr. Huyler's photos. He is writing another book now, called India's Daughters: Art and Identity. In his own words, this books is "a profile of 20 different Indian women from diverse backgrounds and professions all over India. Each is in some way an artist, although not all would consider themselves as such. It is a much more personal survey than Painted Prayers, attempting to give voice to Indian women's empowerment through their own words, stories and art." 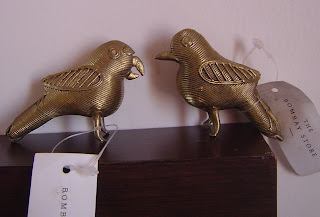 I went to The Bombay Store recently, and bought statues of two tiny metal birds, in traditional Dhokra style. The birds are that famous pair from folklore, the tota and the myna - the parrot and the starling. The parrot is male, the myna female. 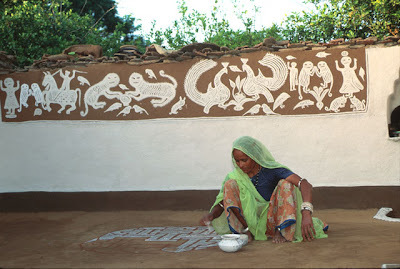 Dhokra is an Indian aboriginal/tribal art form from eastern and northern India. 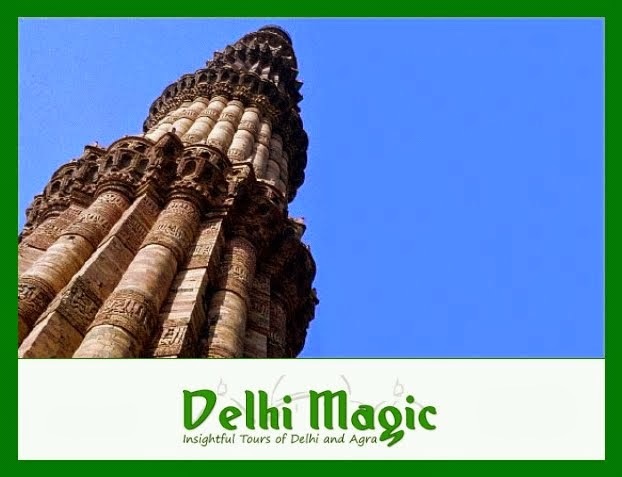 The word Dhokra itself means "oldest" - and refers to the lost-wax method of making amazingly aesthetic stuff with nothing but clay, beeswax and metal scrap to work with. Not only Dhokra artists, but several other Indian handicrafts depict the tota-myna pair (for example, it is a popular motif on Maharashtra's famous Paithani sarees). And in an interesting modern variation - the Indian goverment uses the tota-myna as their brand ambassadors in a birth control campaign in northern India. Called Aao Baaten Karein - Come Let's Talk, this campaign encourages discussion on family planning and contraception, through dialogue between the tota and the myna. In all of Northern India, the tota and myna are recognized as secular symbols representing the male and female form. They are known for their talkative nature. They are considered expert story-tellers, and their stories typically include opposing points of view, banter, humor, riddles, and poetry. Perhaps the original source of this widespread folk symbolism is the Suka Saptati, the "Seventy Tales of the Parrot" - a clever Sanskrit book written in the 9th Century (or earlier perhaps) about the affairs of men and women. The Suka-Saptati was translated into Persian - the Tuti-Namah - and was very popular in the Mughal courts. Once upon a time, there was a merchant who went on a long journey, leaving his beloved wife. He asked his trusted birds, a mynah and a parrot, to keep her entertained while he was away. The wife however, being smitten by another man, arranged a secret tryst through a go-between. The mynah pleaded with the wife to change her mind, offering advice on righteousness. The angry wife tried to wring the myna's neck, but the bird escaped. It was then the parrot's turn. The parrot agreed to let her go, provided she listened to just one story. The parrot then began narrating - and the story was so fascinating, that the wife was too late for her tryst with her lover. Every night, for seventy nights, the parrot told a story - and every night, the wife missed meeting her lover. On the seventy first day, the husband returned, the parrot told him all that had transpired, and the husband was grateful to the clever bird for saving the family honour, so to speak. And in case you're wondering what happened to the wife, well, the wife repented and was forgiven. I presume the husband didn't go on long trips again! "OMG What do I wear?" 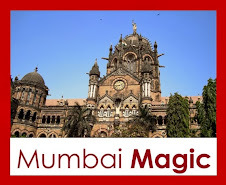 A friend from London - a rather attractive Englishwoman in her late twenties - was in Mumbai last month. We went sightseeing and shopping. Because it was muggy and warm, she wore a dress with a halter neck. It took her all of ten minutes on Mumbai's streets, to realise it was a mistake (if stares could burn, her shoulders would be charred to a crisp). 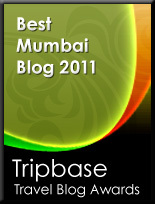 For the rest of the day, she wore a hot cardigan, and didnt take it off even in the 'safe' environs of the Taj Sea Lounge. I met her again in London last week, and over drinks at Corney and Barrow, we laughed the whole incident off. I was in Dubai as well last week - and I worked with several young women, all of them modestly dressed in black abayas. In the ladies loo, the abaya's would be adjusted, the head-scarves wrapped and re-wrapped until modesty was assured. In the same office, there were women from South Africa and London, wearing exactly what they would wear in their home countries - skirts, trousers, jackets. On Day Two at work, I wore what is called 'Indo-Western' - a black raw silk kurta with black trousers and a stole. I realised I was standing almost *exactly* at the sartorial mid-point between the abayas and the business jackets. The whole thing has set me thinking about 'appropriate' business dressing. In the first place, there is the debate about whether or not to be appropriate. When I travel on work to London, I agonise over what to wear. What I *want* to wear is some of my sarees. I know I will look confident and attractive - but Lord, I won't fit in. And it's a bit disconcerting in meetings when people keep eyeing your midriff/waist. It's strange - in London, there's so much cleavage on display at work, and men don't stare. But when it's comes to saree-clad midriffs, there are definitely some startled glances. It is irritating at meetings, when you're standing up to make a presentation, and the audience is not looking at your face. Anyway - what I end up wearing is clunky business jackets, hating how they fall on my five-foot-nothing frame. I tell myself it makes business sense to not look exotic, when you're trying to convince some staid banker that you know what you're talking about. But I resent the unspoken rules. I don't *want* to fit in! On some recent trips, I've started wearing the saree (to hell with the consequences). Perhaps it's a sign of new-found confidence, or perhaps it is just vanity. I don't know. Did you spot the special feeding of the crows in Bombay yesterday? Several houses laid out food in the morning, on plates made of banana leaves. This feeding of crows is one small part of Pongal, the Tamil harvest festival. Not that Bombay's crows need any help with finding food! They're among the smartest birds I've seen. A couple of weeks ago, I saw two of them balancing coolly on top of a moving taxi, pecking at the bag of meat loaded on it. It was Bakr-Id that day, and the taxi had the remains of the day's sacrifice of goats. The two guys in the taxi had no clue their food was being eaten on the sly. My driver laughed when I said, look at those crows making fools of those men! 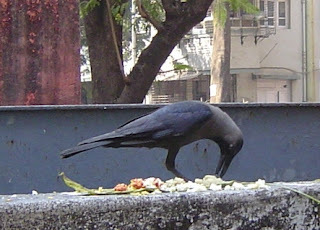 Another common sight in Bombay is crows stealing fish. You'll see them launching stealth attacks on vans and handcarts and taxis, merrily making a meal of the day's fishing catch. Like I said, crows are smart. The only time that they get hoodwinked is by that other clever Indian bird, the koel. The koel (the Indian cuckoo) lays its eggs in crows nests. And baby koels keep the deception going by cawing like crows. Devious, man! Ko bheda pika kaka yoho? What difference, then, between crow and cuckoo? That the crow is a crow, and the cuckoo a cuckoo. **alluding of course, to the sweet song of the cuckoo in spring. As I walk along the streets of Matunga, I marvel at how South Indian culture has been transported to this small stretch in central Mumbai. This tiny pavement shop is a perfect example. It sells all the little things that Brahmins need to live life as prescribed by the Vedas. The Vedas contain rites and rituals for important events such as birth, marriage and death. The central element in the rituals is the sacred sacrificial fire. The long Kusa grass you see stacked on the left is laid on the floor around the sacred fire for purifying the area. Shorter Kusa grass is twisted around the ring finger while offering oblations into the fire. Small twigs of the banyan tree are used to feed the flames. The fire itself is built using dried cowdung cakes as fuel (see if you can spot it in the picture!). On the shelves at the top of the shop, you can see little containers with sandal powder, camphor, sacred ash and turmeric. A little plastic has crept into the packaging, but in all other ways, the rituals remain the same as they were four thousand years ago. We looked around for the shop owner, and spotted him taking an afternoon nap. Obviously, Bombay's modern-day rush hasn't yet reached this corner of Matunga! Can you hear the swish of cotton as she walks? Just a hundred kilometers from Mumbai, the Sahyadri hills begin. This New Year weekend, we decided to go climb one of the hills to see the ruins of Korigad, a fort built on top of the hill. There are nearly 350 forts in Maharashtra, evidence of a martial past, when the Marathas fought long and hard to shake off Mughal rule. 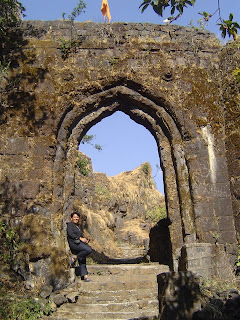 Some of Maharashtra's forts are large strong cunning affairs, built on islands in the sea, or on the shore - but many like Korigad are small clever mountain hide-outs in the Sahyadris. 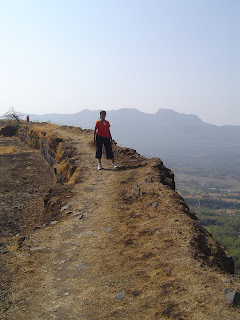 What makes the Sahyadri forts interesting is the way the very mountain lends itself to warfare. How does that help in warfare? In two ways - first, the sides of the mountains are steep. The climb is so steep in places that invading armies can't come up except in ones and twos. And second - the top is flat! In fact, it's so flat that Korigad actually has a lake on top, inside the fort. What a clever place to hole up! There's probably water enough to last for a few months in troubled times. There's a Marathi saying - Jyanche kille, tyanche rajye. He who owns the forts, rules the land. When I went to Korigad, I could see the sense in it. Here's a photo of husband and me at the top, inside the fort. You can see how flat it is. Behind us is a small part of the lake (full pic here). At the far end is the fort wall. Why is the wall only 8 feet tall? Because the other side of the wall is a sheer drop, of course! Barring the one route by which we came up, the other sides of this hill are steep and difficult to climb. They knew what they were doing when they picked this place for a hide-out! The coolest thing about Korigad is actually the fact that it is so close to Bombay - just two hours away - and yet so charming and unspoilt. We sat on the fort wall, in the shade of a leafy bush. We ate salted peanuts, drank cold water, played desultory word games and watched the birds. The afternoon was quiet and still, we had the entire fort to ourselves. I could hear bees buzzing. The breeze and the sun were doing their bit as well, making me drowsy. I tell you, I've become a Sahyadri fan.